I said I was going to give my husband a dose of Feel5ive this morning before he had to face crowded stores and traffic. Little did I know that I'd need some myself. In fact, I took it with me and used it again before we came home. You see, I'm a complete sissy when it comes to snow and ice on the roads - and today was a doozie. The highway was covered with broken patches of compact snow and ice, and in between was just slick. The snow was blowing everywhere, making visibility less than wonderful, too. But, thanks to Feel5ive I didn't get in a panic even once. I didn't even get scared, and that's a first! Thanks to Feel Bach! and Bach flower essences, I had a pleasant day in spite of the weather. Funny how all the other things you need to do get pushed aside when Mother Nature decides to show us who is boss. We aren't having power outages or trees broken by ice, but the temperature has been hovering around zero for several days now. At our house we've been busy bringing in wood and checking the fire every hour to make sure the house stays warm. Our furnace quit, so maintaining the fire was top priority until today - when my husband figured out how to fix it. It's still a priority for me, however, because the wood heat feels so much better. And silly as it sounds, I enjoy the exercise of going out to the wood pile and bringing in a few loads every day. There's something really "down to earth" about that exercise. But... I'm really glad the furnace is working again, because I do want to get out of the house for a few hours and finish Christmas shopping. That means leaving 3 very spoiled canines home alone for the day. Since that upsets them - especially Ralph, my husband's dog - I started dosing their water bowl with "Home Alone" tonight. Animals can sure push us around - A friend called today and said she had tried bringing an "outdoor cat" into the house because of the cold. She made a bed for the cat in the laundry room - gave it food, water, and a litter box. But boy did that cat object. Now her outdoor bed is filled with woolen blankets so she can burrow down and stay warm. I told my friend that if she gets an idea to do that again, to come and get some Feel5ive from me... to help the cat settle down and go to sleep instead of spending the night trying to get out. Bach flower essences sure can make life easier! Stress really can be a joy-killer, so you owe it to yourself to do all you can to banish it. One good way is meditation. You don't have to be formal about it, or follow any rules. You don't even have to sit cross-legged on the floor. Just settle down in a comfortable chair, close your eyes, and begin to relax. To clear your mind of all distracting thoughts, concentrate on numbers. Visualize the number 3, then take a deep breath and as you slowly exhale, see the 3 and say "three" in your mind 3 times. Then do the same with 2 and 1. Take a few more deep breaths while repeating the word "relax" a few times. Now, while taking deep breaths and exhaling slowly, count down from 10 to 1. Next, concentrate on feeling your body parts relax. Some people start with their toes and work their way to the top of their heads. I like to do it the opposite. As you concentrate on feeling, you automatically shift your attention away from whatever had gotten you wound up. Believe me, it feels wonderful! Once you're completely relaxed, just sit there and feel how good it feels. When you're ready to stop, you can count back up from 1 to 5 while telling yourself that "At the count of 5 I will open my eyes and be wide awake and feeling better than I felt before." The next two methods are so simple that many refuse to believe that they'll work. But they do. When something is really eating at you, take it out on paper. Write down all your feelings - telling the absolute truth because no one but you will ever see this. Be angry, hurt, resentful - whatever is the truth. When you have it all out, crumple up the paper and burn it. This method, known as "write and burn," works incredibly well to release anger. When you're in a social situation and can neither meditate nor write and burn, take a breath and let it out in a sigh while shifting your eyes toward the heavens. This releases pent-up negative energy. Using these methods along with Feel5ive, or a custom blend created just for you, will help you to enjoy the entire holiday season - perhaps more than you've enjoyed it since childhood. Tonight while waiting for dinner to cook I browsed through a pet catalog that came today. I was trying to figure out what was in a spray they were advertising to calm dogs - advertised at a mere $39.99. I never did figure out if it was something natural, or some kind of chemical that would do harm in the long run. Of course I was thinking about Feel5ive and it's safety and comparatively low cost. Then I started thinking about all the anti-depressants that people take - I read last week that it is a $12 Billion per year industry. And all those people are taking pills that can do long-term damage to their bodies. It makes me shudder to think of it. I'll stick with Flower Essences, thanks. About that time dinner looked like it was ready to put on the table, so I started to shut the catalog when something else caught my eye. It was an advertisement for Rescue Remedy. Now we all know that Rescue Remedy was the standard for relieving stress before Feel5ive came along and offered Dr. Bach's original formula - but I had no idea about the price! The same 20 ml bottle that FeelBach! offers for $7.95 was $22.99! So, when you order Feel5ive for your pets (or yourself) you not only get the formula the way Dr. Bach intended it, you save over $15 per bottle! I'm still amazed. You've been putting up with me whining about our ever-so-late spring here in North Idaho for weeks now. To add insult to injury, my Seattle area son has been gloating about their fine spring weather. In fact, last week he bragged to me that he had planted his carrot seeds. And he was laughing because my garden still has a foot of snow left over from winter. Did I mention that my kid is a brat sometimes? I was about at the point of getting a blend of Bach Flower Essences that I could take to combat jealousy. And then yesterday I got an e-mail from that son. 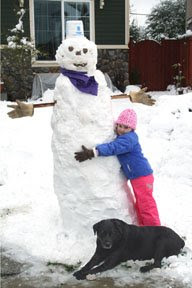 Attached to it was this photograph, taken of my darling grand-daughter Morgan and her dog Iris, playing in their front yard - yesterday morning. I'm not jealous any more. The Seattle area got 7" of the white stuff - and since that's so uncommon, even in winter, I can just imagine the time they're having getting around in it. Now I feel sorry for them. Hopefully it's nearly melted off by now, but my kid needs to take this as a lesson. If you tease your mother, Mother Nature might take offense and get even. Sometimes the events in life can make a person feel like there's no use in trying. And the worse part of it is, when you feel like that, your thoughts and feelings seem to draw more unpleasant events to you. I live with someone who has that problem. He just gets down and has a terrible time finding a reason to even try to get back up. So... after several months of gentle prodding, I finally convinced him to try Feel Bach's remedy: Get Hope Back. I'll have to admit, I can't get him to be as diligent as he should be - he should take it 4 times a day and he doesn't. But it's helping just the same. People who are depressed often deny it. They really do believe that the world is out to get them, that nothing will ever go right, and there's nothing to be joyful about. It isn't until they come out of the fog that they realize that life really is pretty darned good, even with it's occasional troubles. That denial is why it took me so long to convince my husband to take Bach flower remedies. Once many years ago I had a friend who took a prescription drug for depression, and it did help her. I tried to get my husband to take it too, but he refused. Of course now I'm glad. When I see the horrible side effects of those pills, I know that he could have been in worse shape for taking them - they could even have killed him. My next step is to convince him to take Get Hope Back 4 times a day. Judging from the results I see already, I know he'll thank me later. If you see yourself in my position, keep working on it. And if you're the one who feels down all the time, just try Bach Flower Remedies. Either use Get Hope Back, or fill out the questionnaire and get a custom blend. You really do deserve to enjoy life! Before I tell you about a letter we got this week, I have to do a little "Yippee" dance here regarding the weather. Finally, today, it appears that maybe I'm NOT living in a land of perma-snow. Today I could actually see the piles melting - with puddles on the ground around them. AND I found a lily poking it's nose up in one of the flower beds that's finally melted off. There's still a good foot of snow out in the meadows, but around the house it's going away, and I'm celebrating! Now... back to the pets. We had a letter from a lady who was very concerned about her dog's fearfulness. She's afraid of everything outside, and alert to every little sound in the house - nervous all the time. I recommended Feel5ive as a general remedy to calm her and lessen her anxiety, but then I thought more about it. Unfortunately she hadn't told us if this was a new problem, or something the dog had suffered with since puppy-hood. If it was a new problem, it could have stemmed from some event in her life - or some event in the life of one or more of the humans around her. Dogs are so sensitive to our feelings, that this dog's problem could be along the lines of a sympathetic reaction. I recommended using the questionaire to really examine all her dog's behavior traits in detail, so the correct blend could be prepared just for her. And then I suggested that she might want to do the same for herself. As a dog lover, my heart went out to this lady, and my thanks. Some people would just send the dog off to the pound, but she's working to help her be happy. I'm so glad our world has people who care for their pets that way - and so glad that I get to "meet" them, if only through letters. Our pets are becoming so much like children now - especially for us Baby Boomers whose human children have left the nest. I wonder if keeping them with us like we do doesn't make them suffer from more human emotions than we realize. For instance, my old Harry dog chewed holes in his feet and his tail - and it didn't matter what I tried to stop it, I couldn't. I used every kind of soothing shampoo I could find, rinsed him thoroughly, applied salve, monitored his diet, gave him Benadryl - everything I could think of. I was treating him for a physical ailment - with no luck - but now I wonder if his chewing wasn't the result of emotional distress when I left him alone for hours every day when I went to work. He was never naughty when I left, but he did always look sad when he watched me go. According to an article I just read, The Bach Flower Essence Agrimony works to cure both skin conditions such as Harry's and restlessness. It mentioned using Agrimony for wild animals who are caged and constantly pace back and forth, as well as for pets who just can't seem to settle down and those who seem to "suffer in silence." Based on that information, it makes me wonder if skin irritations aren't very closely related to emotional disturbances that keep us and our pets from feeling at ease. I had assumed that Harry had an allergy - but perhaps it was an emotional allergy and not a physical one. If you have a pet who chews like Harry did, it would be worth trying. The article also said that Agrimony would ease other skin irritations, such as flea bites, sore sutures, etc. Of course, if you have a skin irritation it would also be a good idea to consider what emotional state might be causing it. You just might find that a few drops of Bach Flower Essences every day will cure you while prescription drugs do nothing. Luckily, some bright physicians are finally realizing the mind-body connection. But until they all do, it will be up to us to examine our own lives and emotions and take steps to heal ourselves, with help from nature.